All was well for me until I came across an article with the headline “Maple Leafs Keep Doing Things the Right Way, Expect to be Rewarded by Hockey Gods.” This was the second article in the span of about a week that heaped praise upon the storied franchise just up the QEW while taking a subtle, or not so subtle, jab at the way the Sabres have executed their rebuild. The previously mentioned article, from The Hockey News, goes off a quote from Leafs bench boss Mike Babcock and praises the play of the prospects getting their first extended playing time in Toronto. Earlier in the week The Score came out with an article claiming the Leafs were better at rebuilding than the Sabres. To support this stance the author used such hard hitting facts as: Mike Babcock picked the Leafs over the Sabres, the Sabres fired their director of performance and the Leafs haven’t fired their director of sports science. Oh, and the Leafs beat the Sabres in meaningless late March game. Both of these articles operate on the premise that there is a right way and wrong way to rebuild a roster, and that one team can be better at it than another. Whether or not there is a “right way” to rebuild seems to be more a matter of opinion than anything. It certainly is possible to be bad at rebuilding (see: Oilers, Edmonton) but to make the claim so early in the process for both the Sabres and Leafs, with so little substantial evidence to reinforce it, is pretty bold. With that in mind I thought I’d do the research that The Score decided not to do, and see where the Leafs and Sabres stand in the climb back to respectability. To start, let’s go back to the beginning; when did the light bulb finally go on for these franchises and when did they come to the realization that an overhaul of the roster was needed? The Sabres can point to February 27, 2012 as the date the rebuild truly began. On that date Darcy Regier somehow managed to get a 1st round pick from Nashville for Paul Gaustad. Gaustad was the first shoe to drop, as the likes of Jordan Leopold, Robyn Regehr, Jason Pominville, and Andrej Sekera were all shipped out for picks prior to July 2013. The Leafs, on the other hand, were blinded by the light of an unsustainable playoff run. Toronto secured the 5th spot in the Eastern Conference during the lockout shortened 2012-13 season despite having a league-high PDO of 103 and a league-worst Corsi For Percentage of 44.1. While scores of people (with the possible exception of Brian Burke) knew the year was a mirage, the Leafs went on trading away picks as late as June 2014. It wasn’t until February of 2015 that the Leafs finally began the tear down with the trading of Cody Franson and Daniel Winnik. Almost three years removed from when Darcy Regier began to tear down the Sabres. The Sabres did not have a very deep prospect pipeline in 2012. They certainly did well in terms of NHL bodies as Tyler Myers, Tyler Ennis, Marcus Foligno, and Jhonas Enroth were all drafted between 2006 and 2008. In terms of prospects in Rochester or elsewhere in 2012, the Sabres were a bit lean. Joel Armia was the top forward prospect, but he was an unproven quantity still plying his trade in Europe. Mark Pysyk was leading the next wave on the blue line, impressing for the Edmonton Oil Kings out in the WHL. Behind them Brayden McNabb was showing promise and Zack Kassian was shipped out in the Cody Hodgson trade. The cupboards were fairly bare beyond that handful of players. The Leafs, on the other hand, did very well in the drafts leading up to their tear down. The Hockey News article rattled off the list of promising Leafs prospects currently playing well for the club, yet looking further will show the majority of them were in the pipeline well before the Leafs finished 27th in the league last year. Sam Carrick, Garrett Sparks, Josh Leivo, Viktor Loov, and Connor Brown have all impressed this season with the Leafs; they were also all drafted between 2010 and 2012, and all were drafted in the 3rd round or later. Even the jewel of this group of youngsters, Williams Nylander, was selected 8th overall in 2014. Whether it was due to a few swings and misses at the draft table, the reliance on video scouting, or something else altogether it is very clear that the Sabres were subpar in relation to the Leafs in regards to drafting and developing prior to the rebuilds. When the Sabres were going through their tear down phase there was really no one NHL ready to come up and at least make the results of the last two years somewhat palatable. That left the Sabres with the likes of Matt D’Agostini, Zenon Konopka and Cory Conacher to clean up while Toronto have benefited from the debut of prospects that have been slow cooked. Despite only being in the first year of their tear down, Toronto clearly has more than a few NHL ready bodies prepared to cut their teeth this season. This is not only evidenced by their play since the trade deadline, but also the Marlies’ dominance of the AHL the past four seasons. Where the Sabres do have an advantage is the rest of their pipeline. While Rochester has been thin on talent the last few years, the picks and prospects the Sabres have will definitely be skewed in Buffalo’s favor. Darcy Regier did quite well in his final draft for the Sabres, bringing in Rasmus Ristolainen, Nikita Zadorov, JT Compher, Justin Bailey, Connor Hurley, and Cal Petersen among others. Tim Murray has done a terrific job continuing what Regier started. The lack of trade market for goaltenders makes the return he got for Ryan Miller all the more impressive. He was also able to ensure the Sabres got one of Connor McDavid or Jack Eichel at the 2015 draft while strengthening the NHL roster for the future with a pair of blockbuster trades. Murray’s store of riches includes franchise cornerstones Sam Reinhart and Jack Eichel along with deeper draft finds such as Eric Cornel, Brycen Martin, Brendan Guhle, Will Borgen, and others. Murray’s willingness to pull the trigger at the trade table has help speed things along as Zach Bogosian, Evander Kane, Robin Lehner, and Ryan O’Reilly have all been immediate contributors. That is about as close to a franchise overhaul as it gets, and with 12 draft picks and plenty of cap space this summer it’s a near certainly more deals will be made in June and July. Where the Sabres lacked in depth in 2012 and 2013, they thrive in entering 2016-17 and beyond. The Leafs have been busy in the early stages of their rebuild as their collection of slightly older prospects have stepped into the league this spring. However, they’re left with a cupboard that has been picked bare in some areas. The 2015 offseason represented the first major step in stocking the upper reaches of their pipeline as the Leafs grabbed Mitch Marner and Jeremy Bracco at the draft and turned Phil Kessel into Kasperi Kapanen and an extra first in this year’s draft. Brendan Leipsic, Zach Hyman, and Scott Harrington were brought in via trade, and free agent Nikita Soshnikov has already impressed. Like Buffalo, Toronto holds a dozen picks at this year’s draft along with plenty of cap space. I expect to see Lou Lamoriello follow a similar path as Tim Murray did last summer to use his picks and prospects to acquire NHL talent. It’s clear when comparing the two franchises the only real differences between them were that the Sabres started the process a few years earlier than the Leafs, and that the Leafs had a better prospect base at the beginning of their rebuild than the Sabres did in 2012 or 2013. One more difference can be found behind the bench. The Sabres had Ted Nolan behind the bench for their two years tearing down the roster, while the Leafs employ the best coach in the game. The Babcock card was played by both The Hockey News and The Score in saying that the Leafs are doing things “the right way” or were “more adept at rebuilding” than the Sabres. It’s important to not look at this through a Maple Leaf blue colored lens. Tim Murray took over just weeks after Pat LaFontaine hired Nolan. It was bizarre in that the GM almost always hires the coach, and Murray wasn’t afforded this opportunity. While Nolan was not given a roster talented enough to win in the NHL, it was clear he was tactically overmatched. Nolan failed to do the basics, such as matching lines; his penalty kill units were not set up to defend the most basic of powerplay systems. Murray was between a rock and a hard place when it came to acting on Nolan. The organization was getting derided locally and nationally for tanking and firing the coach would have made an already bright spotlight more intense. The Sabres put up 52 and 55 points in their two seasons of bottoming out, both with Nolan coaching. They certainly wouldn’t have competed for a playoff spot with a more capable coach, but it’s certainly within reason to suggest that those point totals would’ve been in the mid 60’s. The Leafs had a different set of circumstances in the lead up to the Babcock hiring. Randy Carlyle was dismissed prior to the beginning of the sell off and an interim coach was installed. This paved the way for Lamiorello and Brendan Shanahan to hire whomever they wanted in the summer. Babcock, coupled with the Leafs group of NHL ready prospects has given the Leafs life down the stretch. So much so that they’re threatening to inch away from the 30th place finish that seemed inevitable prior to the trade deadline. As of today they remain in the league basement, but their improvement on the ice has certainly been noticeable. While I don’t like to deal in revisionist history, it would be interesting to see the narrative if it wasn’t Babcock behind the bench and the Leafs had 55 points this year instead of 65. To say that the Leafs are doing a better job rebuilding than the Sabres is a statement made out of naivety. The Leafs certainly aren’t doing a bad job, and may be a bit ahead of where the Sabres were after a season and a few months, but the makeup of the respective franchises at this time would indicate that the Leafs first year rebuilding would be better than the Sabres first year or two. The discussion will change entirely depending on which way the ping pong balls bounce in 5 weeks’ time. The Sabres currently have an advantage over the Leafs when it comes to the rebuilds in one key area: Jack Eichel. Buffalo was able to grab its franchise centerman, while the Leafs ability to draft theirs will hinge on the draft lottery and the perennial specter of the Edmonton Oilers. It’s interesting that the Leafs are viewed as currently doing things the right way, while the Sabres were admonished during their tear down phase. The evidence shows that the two organizations went about their plans virtually the same way; the Leafs, to their credit, didn’t have to restock their organizational depth the same way the Sabres have had to over the last few seasons. The Sabres were the talk of the league (along with the Coyotes) in their quest to get McDavid or Eichel, yet it is forgotten that the Leafs went 12-35-5 over the final 52 games of last season on their way to drafting 4th. Toronto also followed the Buffalo model of last year as they traded away NHL regulars at the deadline this season in what was seen as an effort to improve their lottery odds. Just a year ago the Sabres shipped away seven NHL players as they pushed towards the McDavid and Eichel sweepstakes. This is not to say that the Leafs should be getting the same scorn the Sabres got last year but rather to say that if Lou Lamoriello, one of the best minds in the game, is executing his rebuild with striking similarity to the way in which Tim Murray has operated in Buffalo, then perhaps both organizations have done things the right way. 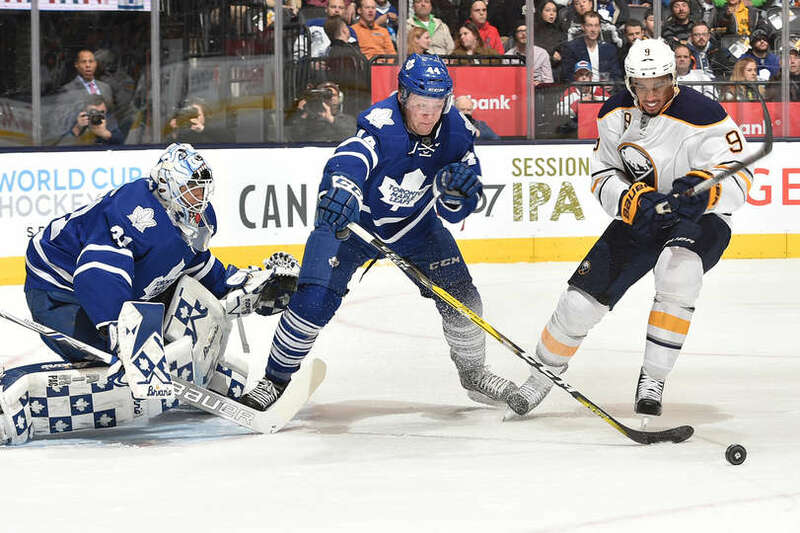 It is too early to tell whether the Sabres or Leafs rebuilds have gone down the correct path because neither team is at the point of contending. It looks like both teams are in better shape than the Oilers are, but that is a really low bar to get over.